In November 2016, voters approved $572 million in bond funding to build and improve schools. The Denver Board of Education opened the 2017-18 school year with an update on projects that include new construction, upgrades, heat mitigation and quality learning environments. In 2017, the bond will fund facility projects at 126 schools, totaling more than $200 million in investments. Of these projects, 96 fund critical maintenance, including heat mitigation and sustainability efforts. The Montbello Campus, for example, received upgraded lighting, heating and cooling systems and replaced an artificial turf field. And McGlone is getting a major facelift and an addition, with upgraded learning environments based on school-driven priorities, including upgraded auditorium audiovisual systems, improved lighting and an expanded STEAM makerspace lab and library that will be accessible to the public. The update also included a spotlight on the district’s commitment to Minority- and Women-Owned Business Enterprise (MWBE) and Small Business Set Aside Program for bond projects. As of June 30, 26.2% of the $184 million spent thus far was committed to MWBE, with forecasts for 30% of the total bond funding going to minority- and women-owned businesses. See the bond presentation to board members. In addition to funds to improve our facilities, voters also approved a $56 million mill levy override that largely provides investments in our Denver Plan 2020 goals, getting to Great Schools in Every Neighborhood by providing support for the Whole Child, investing early in Foundations for Success, developing College and Career Readiness, and leveraging great teachers and leaders to get us there. The mill levy provides $15 million in new funds across all our schools for supporting the Whole Child. Schools will have discretion to determine how to spend the funding for social-emotional learning, prevention curriculum, climate-culture supports, community partner services or training that most aligns to their needs. Schools are using data from sources like the Student Satisfaction Survey and Whole Child Report to define their annual needs. Funding amounts per pupil range dependent on school grade level, and students’ direct certification (includes certain homeless, runaway and migrant children from households that receive benefits and are deemed categorically eligible for free school meals) or Free and Reduced Lunch status, from $25 for a non-FRL high school student to $184 for a direct-certified elementary school student. Preliminary budget data shows that nearly two-thirds of these new funds are being put toward increased social-emotional supports at the school level, including increases in psychologists, social workers, restorative justice coordinators, counselors and deans of culture. Also in support of the Whole Child, Summer Academy will be expanded to 185 hours for 2,500 students, ensuring approximately 1,000 more students have access to summer learning. The mill includes $6.8 million to support key components of our early literacy plan. Last school year was our first year of implementing the plan, and already the funding is helping us achieve success. DPS students in kindergarten through third grade posted double-digit gains on early literacy exams, as seen by the most recent Colorado READ Act assessments (read more here). More than 95% of early literacy funds in the mill are going directly to schools. Educators also directly benefit from these funds — 20% of the mill funds went to extra duty pay at the New Teacher Institute and Foundations literacy training, as well as for early literacy specialist stipends. An additional 5% went to professional learning supports, including space, materials and staff supports. As a result of the mill levy, $14.5 million is helping to increase the effectiveness of our school and classroom leaders. Through the Teacher Leadership & Collaboration model, 27 schools are adding team leaders for the first time this school year, and 55 high-poverty schools are receiving additional funding to add team leads, creating a staffing ratio of one senior or team lead for every six teachers. The district also funded its first cohort of 19 paraprofessional educators in a para-to-teacher program in 2016. An additional 24 educators will begin the second class this year. These educators will receive scholarships to cover 100% of their tuition remaining after what they receive in Pell grants. More than 50% of the participant are educators of color. The mill investments include $8 million in funds to ensure that DPS graduates are college and career ready. Of that, $1.5 million is expanding concurrent enrollment, with the goal of every student having the opportunity to take at least one 3-credit hour college course while they’re in high school. An additional $4.8 million has been invested in CareerConnect to increase student access to career pathways programs at 13 schools this school year. Finally, the bond includes $70 million in technology funding and $6.6 million in mill funds to increase access to technology in the classroom, with $100 per pupil in one-time bond funds and recurring mill funding (ranging from $16.50 for non-FRL students to $66 for FRL students) to refresh aging devices. This is in addition to $67 annually from prior mill levy funding. 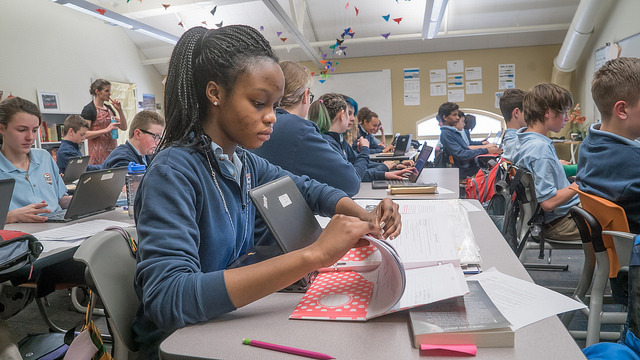 Phase one of the MyTech program is also launching, with 14 competitively-selected middle and high schools receiving additional bond and mill funds to expand technology in their schools, including 1:1 take-home Chromebooks going to nearly 9,000 students this year. Read more about how DPS students started off the year with 1:1 technology here. Instructional Superintendents Tanya Carter (elementary) and Suzanne Morris-Sherer (secondary) discussed with the board how school leaders are spending their flexible mill funds. See the mill levy presentation to board members. Importantly, DPS holds itself accountable for the use of voter-approved bond and mill funds with oversight committees. Of 54 applicants, 15 were selected, including parents, teachers and community members. Individuals serve 2- or 3-year terms with the option to renew. The committees report to the Board of Education twice a year, typically in October and May.